My absence from the blog proved longer than expected, for as soon as Deadline Frenzy had ended, I was visited by a bout of Flu, which had the delightful cumulative effect of making me feel about as dreadful as a week in Scunthorpe. ANYWAY: a few days back , while sorting out The Study – an ongoing process which is almost doomed to failure because I’m a hopeless magpie who can always generate some flimsy excuse for keeping things – I came across something which, as is often the case with such endeavours, plunged me into deep, unfettered nostalgia. Perched on top of my study’s loftiest bookcase was a selection of genre-related CD-ROM’s from the last decade – The X-Fileset al – but the one that took my interest was Star Wars: Behind The Magic. Released in 1998, the two CD set was designed to be an in-depth and information bank relating to the existing – and, as Kevin Smith’s various film characters call it “Holy” – trilogy. 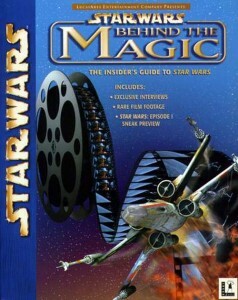 Obviously, given its proximity to the hugely-anticipated release of Episode Ithe following year, it dutifully had a preview of the film to give it an added selling point, but primarily, it was a superb and well-designed resource that was ideal for SW fans in those pre-internet days. Aside from such expected facets as full guides to characters, locations and ships, detailed scipts et al, it had some engaging interactive elements, such as a 3-D walkthough of The Millennium Falcon and, more amusingly, an area where you could test the franchise’s various weapons out on a not-exactly-willing Stormtrooper. Most attractively of all, it contained a genuine “holy” artefact in the form of several deleted scenes from the original 1977 film. Surprisingly, in the face of Star Wars many home video releases, Behind The Magic remains, to my knowledge, the only (legitimate) place where these scenes have appeared. Looking at this set again, it made me particularly wistful for what, in terms of Star Warsfandom, was an infinitely simpler yet wildly wonderful time. A few years before I bought it, in 1994, I was in my first year of university at Winchester and where I’d met a kindred spirit in Anthony Willis, now a film editor who remains one of my closest friends. It was with Anthony with whom I shared a tremendous obsession with The X-Files during our time there, but it was via Star Wars (and Indiana Jones) that we first clicked. He, in particular, was a massive fan of the “Expanded Universe” SW novels (especially ones authored by Kevin J Anderson) and, being an avid computer gamer, introduced me to the dangerously-immersive joys of Tie Fighter(released that year) a flight sim title to which I lost countless hours to. Most vitally, though – and maybe I’m just terribly guilty of the old rose-tinted specs here – there was a palpable mystique. Maybe that was because of the lack of the internet, where Star Warsfandom has become distinguished by tribalism (especially in the wake of The Prequels) and intensely scrutinising to the point where there perhaps needs to be a polite reminder that, actually, all this is just fictional. Sixteen years ago, it felt like there was a distinct creative vitality still at play – that the franchise had innumerable places to go and for a time, via The Expanded Universe, it really did. And, crucially, the core enterprise of the films still harboured a tantalising sense of mystery that has now, of course, been all but extinguished. The broad strokes of the back-story of how Darth Vader came to be had always been known to ardent Star Wars fans and, come the confirmation that the new Star Wars films would be anchored on this element of the mythology, a huge part of the anticipation came from just what details those hallowed broad strokes would be bestowed. I agreed, and we left it at that.